The tree's decorations have come a long way since 1931, when tin cans and scrap paper replaced garlands and glass. In 1934, organizers festooned that year's evergreen with 1,200 colored lights and ornaments shaped like dogs, horses, giraffes, sailboats and stars. A public-address system also piped in holiday tunes, creating the effect of a singing tree. The 1950s saw a white spray-painted tree, the return of garlands made of cranberries and popcorn (or, at least, plastic balls that resembled the festive foodstuffs) and 10-ft.-long aluminum icicles that turned treacherous in high winds. 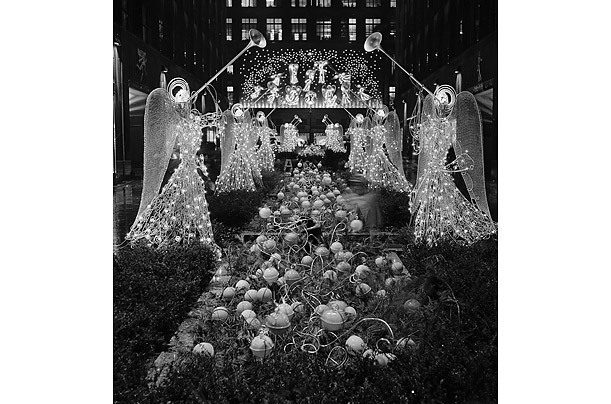 In 1954, Saks Fifth Avenue inadvertently created midtown traffic jams with its 32-ft.-high display of aluminum angels floating along the building's facade, above. And for a few brief minutes in 1980, a human body adorned the tree before police could arrest the man who had unsuccessfully tried scaling it.